Brazil’s former president Michel Temer been arrested on Thursday as part of the sweeping and years-running ‘Operation Car Wash’ anti-corruption probe, regional media reports say, after the predecessor to Jair Bolsonaro left office on January 1. Temer has reportedly been sought by police, who reportedly have been trying to trace him since he left office. Temer, who served as president from 2016 to 2018 after the impeachment of Dilma Rousseff, has consistently denied any wrongdoing when he was first named as one among the dozens of politicians and business executives rounded up and convicted as part of the multi-billion dollar corruption scandal dubbed Operation Car Wash — named so because it was first uncovered at a car wash in Brasilia. The allegations first came against Temer during his presidency in 2017, but which were blocked by allies in Brazil’s congress. Temer’s long-time-in-coming arrest happened Thursday morning in a police raid on his house in Sao Paulo, after which he was transferred to federal police headquarters in Rio de Janeiro. Brazilian news portal Globo further reports former energy minister Moreira Franco is also being sought by federal police, who is also facing graft charges. 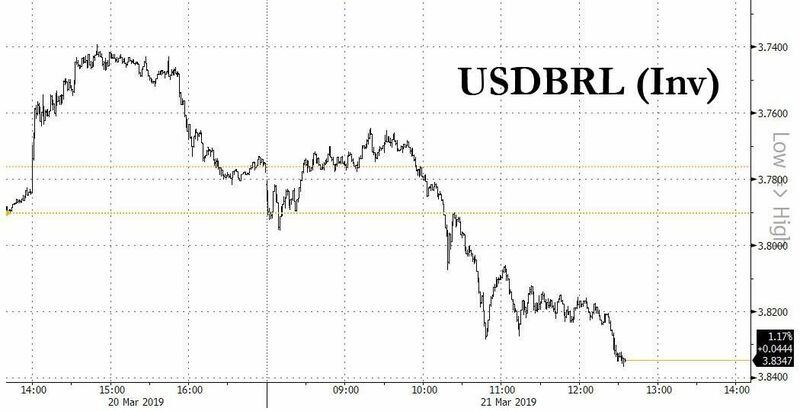 Per Reuters Brazil’s currency slipped as much as 1% on the news, with the Bovespa stock index quickly falling 1.5 percent. Since 2014 Brazil has been gripped by a scandal that started with a state-owned oil company and grew to encapsulate people at the very top of business – and even presidents.